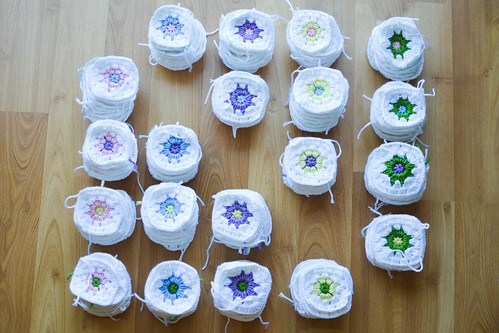 Some time last year, I read this blog post from According to Matt and decided that I want to make a granny square blanket, too. 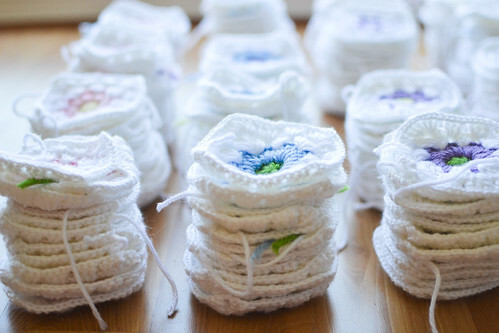 I have never made a blanket before and it would be nice to start on this project. After deliberating with my sister, the graphic designer, we came up with a color scheme and combinations for my blanket. My sister said that I should just go with two-color combination as opposed to three-color like Matt did on his blog. This would make things easier for me and I like the idea of more white. On August 8th, 2012, I started my first granny square. I have set a goal for myself that I should make at least one square each day and gave myself one whole year to make 432 squares. That would allow me with a blanket of 18x24 squares. I'm happy to report that I have finally went over the 50% mark. I've been way behind on my progress but I'm quickly catching up. Currently, there are 281 squares completed and I have 2 months left to finish the other 151 squares. Once the squares are finished, I will have to join them together and I figure that would take at least another month. By the time I'm finished, the cold season will creep around. Perfect!